You Sell Online Advertising, But Do You Have a Sales Plan? With all of the recent news about job cuts and ad spending declines, even with online, how can an online sales person stand out? In the fall of 2006 during a job interview the CEO of a new, well funded, online media company asked me if I ever read the book “Hope is Not a Strategy”. This guy had founded, and sold several software companies, and made lots of money from them. He wanted to know what type of sales strategies online sales people used. His former heads of sales it turns out all had very elaborate systems for their teams. My initial comment was that when an RFP comes in at 3pm on a Friday and is due by 5pm the same day it can be tough to map out a full strategy. He knew that I was referring to a very short sales cycle with online, versus a very long sales cycle for software that could be a year or more. However, as we started talking about quarterly and annual planning that most online businesses do, he jumped in again and asked, “but what planning do the sellers do to” ? At the end of the conversation he gave me a homework assignment to read the book “Hope is Not a Strategy” I read the book, wrote a report, believe it or not, and had a new view on how to better sell. At the end is a link to the report, and below are a few thoughts from this book as it can apply to online ad sales. More importantly, this blog post is meant to be a motivator for any online sales person looking for an edge right now. Additionally, anyone on the ad agency side, who pitch new business as frequently as ad sales people do, may find this valuable too. 1) It is almost impossible to give a tailored, focused presentation if you haven’t spent time face to face with the client before the presentation. 2) Did you have a team strategy session prior to the presentation? 3) Selling ad solutions (Or agency solutions) means reducing risk for the client by taking responsibility for account management, custom ad integration, and deal optimization. After weeks of back and forth during this long job interview, and conversations about sales strategy, I received a call that I was the finalist, and then presented with the offer. It seemed that not only did no one else read the book, but no one else put in as much time to create a relationship with the CEO. By putting in the time to learn about this person, my customer in many ways, I was able to understand his view of what online advertising was, and could be for his business. In the end I chose to join a different company, and not because of him or the process, that only made it much more difficult to say no. However, this process reinforced that taking the time to get to know someone, their views, and never giving up when you need to fight can go a long way. All of us over the past few weeks have been in conversations about how the economy has negatively affected online advertising. While there are companies that have let go of employees, or have wound down, there are some looking to get started, there just has to be. The entrepreneurial spirit is very contagious. Anyone out there that has an idea for a business that generates revenue from online ad sales, keep fighting. And of course, anyone looking to get started with an idea, fight through to execute on that as well. While I’m sure you already have a great business plan format, here is one I came across online from Sequoia Capital. Online ad spending in the U.S. will come in at $26.17 billion this year for a gain of 23 percent, forecasts Lehman Brothers analyst Doug Anmuth in his Internet Inside Weekly report (pdf only, not online). That’s down slightly from his previous 2008 forecast of $26.20 billion (+24 percent). Secondly, Anmuth expects online advertising to grow at a 20 percent 3-year compound annual growth rate (CAGR) and that the web will take an 11 percent share of total domestic ad dollars by 2010. His latest forecast is right in line with ZenithOptimedia’s call for a 23.4 percent rise over 2007 and eMarketer is also expecting a 23 percent gain this year. Back in January, TNS, which only measures display, offered a much more pessimistic view, saying that category would be up only 14 percent in 2008. Also on the comparatively darker end, PQ Media, which lumps several categories like digital out-of-home under “alternative media,” said it believed that spending would climb just 20.2 percent over last year. — Search will still lead: Breaking out online ad spending into constituent categories, Anmuth finds search still in the lead with 27 percent growth, followed by display with 25 percent, while lead gen should be up 18 percent, as classified struggles to realize gains of 14 percent, all over 2007’s figures. — Display’s mixed bag: Display advertising, which accounted for 34 percent of total U.S. online ad spend in2007, while getting a boost from formats such as rich media and digital video, has faced several challenges recently. One of the biggest factors impacting overall display advertising has been the dramatic rise in “available non-premium” (or non-guaranteed) inventory over the past few years, which has resulted from the enormous growth in page views at MySpace and Facebook. That in turn, has fueled the rise of remnant ad networks, which tend to specialize in low-priced, unsold inventory (which Martha Stewart Living Omnimedia‘s ( NYSE: MSO) Wenda Harris Millard likened to the trading of pork bellies, decrying the commoditization of online ad inventory). That has led companies like MSLO and others to form vertical ad networks to support their premium pricing and placement offerings. Anmuth will be giving a presentation at our EconAds seminar in NYC next week.. details on the seminar here. The economy might be in trouble but advertisers and publishers at the Online Publisher Association’s Forum for the Future were still upbeat today about the prospects for online advertising. “The first thing people need to do is to decaffeinate some of those expectations (about the economic outlook),” Rapt CEO Tom Chavez said during a State of Advertising panel discussion at the OPA’s meeting in London. eMarketer founder Geoff Ramsey helped cut through the clutter of conflicting statistics about key trends in online advertising, social networking and virtual worlds. Video advertising is likely to grab the lion’s share of online advertising in the future, he said. Marketers are already starting to shift their budgets to video, which could reach $2.5bn by 2012 in the US alone. Some publishers said increasing video advertising was their number one priority for 2008, although a straw poll around the conference room in London did not show a large number of hands among the audience of around 200. Combining online video with behavioural targeting is one key strategy, as long as you stay in the real world. Second Life, Ramsay said, is not a “mass-reach vehicle.” Out of its 13 million residents, only 877,000 use the site every month and most corporate locations attract less than 500 visitors a day. Britain leads the pack when it comes to spending on online advertising – the spend per head is $143.48 compared to $112.17 in the United States, Ramsey pointed out. China, with the world’s biggest Internet population, is at just over $5 for now. But, advertisers have to work harder to gain their audience’s trust. Trust in the industry has fallen to 17 percent of consumers in 2007 from 25 percent in 2005, behind the legal industry and only slightly ahead of tobacco, according to research from DoubleClick. When consumers were asked how much they trusted specific types of advertising, mobile ads scored the lowest at 18 percent, followed by banner ads at 26 percent, search at 34 percent, and TV and magazines at 56 percent. But hearing about products through friends and family was most trusted at 78 percent. One way of exploiting such data is to focus increasingly on advertising on social networks, such as Facebook , where users provide valuable information about themselves for advertisers. But that poses its own challenges. Data from the U.S. showed that 54 percent of social network users said they never click on an ad and 80 percent said they would not add a brand as a friend. As consumers use of mobile devices rise, marketers will need to look for cross-media properties that allow consumers to interact with brands, while on the go. Search is not as big as we might think. How do people think of what to search for? Think brands, not search, stupid. Create “hooks” back to your site. Calls to action to your site. Examples of viral content includes things such as Top 10 Lists, How To’s, Videos, Quizzes, easlily scannable text, topical events. Ensure that this content is easily accessible. Vanessa mentioned to think beyond page views, create content that entices “web stickiness” and increases the time spent on your site. So where can you find ideas for linkbait content? Use Google Suggest to search for a topic. Type in something like “how to choose”, “how to improve”, or industry specific terms. In addition, look at industry news sites to see what the current buzz is about. Using MSN adCenter Labs you can also use the keyword funnel to find link topics. People who search for mortgage rates may in fact be looking for mortgage calculators. Calculators are great forms of linkbait. Make your content easy to share – DIGG, reddit. del.ico.us, YouTube, nice sites, niche directories. Communicate Your Linkbait to your existing network – newsletters, email signitures etc. Incorporate Offline Marketing – brochures, ads, events to communicate your online tools, calculators etc. Add links to the linkbait. Provide Support and Content Details – people may have feedback to share on your linkbait. Keep Your Content Alive – leave the linkbait content on your site. Make it easy for users to access. There is nothing worse than a broken link to linkbait content. I posed a question with regards to blended search results in terms of whether links to items such as video or blogs carry more weight than links to traditional webpages. I did not receive a response to this. It poses an interesting scenario though doesn’t it? Is a link to a webpage the same as a link to a video? I always love to read scaling discussions, especially about popular web apps, and there are loads of them out there. Here’s my overview of the best. By the way, the best book on scaling apps I’ve ever read is Building Scalable Websites, by Cal Henderson (the Flickr guy). It’s dog-eared on my desk, and taught me about sharding (which I used extensively for mefeedia). Sharding is when you cut a really big table into pieces, so you can put those on separate servers. It means you have to make changes to your code, and your database isn’t so database-y anymore, but it works. For example, online games use sharding to grow their virtual worlds, because there’s no way they could serve all that information from 1 db cluster. Scaling Twitter with Ruby. Twitter is hot today, and they ran into some serious scaling problems, although the app itself is quite simple. It consists of messages of maximum 140 characters. Lessons are the same as most apps: Memcache like crazy, and optimize the database (the biggest bottleneck most of the time). Also, Ruby on Rails scales pretty much the same way as PHP and other similar languages: shared nothing architecture. Shared nothing means that there is no 1 thing that is shared by all servers, since that would become a bottleneck. PHP, for example, has shared nothing architecture out of the box, except perhaps for sessions, but that’s easily solved by storing sessions in a db (which then has it’s own scaling approach) and not in the filesystem. Here’s a talk by Rasmus Lerdorf that explain scaling with PHP5. ( Here’s the mp3 audio recorded by Niall Kennedy). Kevin Rose mentioned this was “the bible for scaling Digg” – and I think quite a few other web apps are based on this. Bloglines. Bloglines’ scaling problems where slightly different from your average web app, since they are an aggregator of feeds. That means they have billions of blogposts they have to keep and serve to users, and that creates its own scaling problems. The Bloglines approach was to, instead of using a database, just store all that stuff in a special filesystem. Today it’d be easier to do this since there are a few filesystems that do that, or you could just go with S3 again. Mark Fletcher (who also sold Onelist to Yahoo which is now Yahoo Groups) has given a few talks on scaling Onelist and Bloglines: here’s the mp3 audio version, and here’s the PDF of that talk. And a text transcript. I haven’t linked to lots of good thinking about scaling, or to technical resources and stuff. But the presentations should get you going in the world of memcached, perlbal, nothing shared and federation 🙂 Enjoy! PS: See also How I Unexpectedly Found Myself Doing Consulting For Startups (this is a post on my “professional” site. I haven’t been able to figure out when to post here or there, any tips on that?). Finally, Dan Pritchett has a good presentation on scaling eBay (PDF). 26 Billion SQL queries per day! 300+ new features per quarter! 4 architecture versions since 1998 and some pretty crazy scaling of the search. New: presentation on how Facebook uses PHP APC cache (PDF). A talk on Youtube scalability: “In the summer of 2006, they grew from 30 million pages per day to 100 million pages per day, in a 4 month period. Thumbnails turn out to be surprisingly hard to serve efficiently. (I ran into this with mefeedia too, luckily Amazon S3 came to the rescue by then. )” Youtube uses Python, Apache, MySQL, Memcached. CHICAGO (AdAge.com) — Revenue for U.S. agencies — advertising, marketing services and media — jumped 8.6% in 2007 despite a tepid ad market. And for that, you can thank digital. Ad Age estimates that the Big 4 ad firms — Omnicom Group, WPP Group, Interpublic Group of Cos. and Publicis Groupe — last year generated 12.3% of worldwide revenue from digital services. While it comes as no surprise that revenue at digital specialty agencies rocketed last year (up 26.8% in the U.S.), it’s clear that digital services have become a way of life (or a way to avoid death) for agencies of all disciplines. In fact, U.S. ad agencies reported an average 10.2% of revenue from digital in 2007. And in some cases, it was a lot more. Goodby, Silverstein & Partners — Ad Age’s 2008 Agency of the Year — said digital services last year generated 52% of its revenue. The San Francisco agency works for such digitally connected clients as Hewlett-Packard Co.
Of the more than 860 agencies that participated in the 2008 Agency Report, 60% broke out digital revenue. Digital helps explain the solid growth experienced by major media agencies despite flat spending in traditional media. WPP Group said worldwide digital revenue for media unit Group M last year soared 53% to $238 million. Ad Age DataCenter estimates that digital accounted for more than 11% of 2007 revenue for Group M, the world’s largest media-agency group. Digital has reshaped direct marketing, and that has turned top-tier direct shops such as Rapp Collins and Wunderman into some of the biggest digital agencies. Digital is about technology and platforms; it’s not a narrowly defined discipline. For the U.S. digital ranking, Ad Age tracked agencies’ digital revenue regardless of discipline, resulting in an eclectic list of agencies — digital pure plays as well as advertising, marketing-services and media shops — all dialing for digital dollars. Digitas tops that digital list; Publicis bought Digitas last year and is moving fast to make it a global agency brand. Avenue A/Razorfish, acquired last year by Microsoft Corp., came in second. New to the list: IBM Interactive, a rebranded rollup of IBM’s digital-marketing services. Last year’s U.S. revenue growth rate for agencies of all disciplines — 8.6% — was slightly below 2006 growth (8.8%). 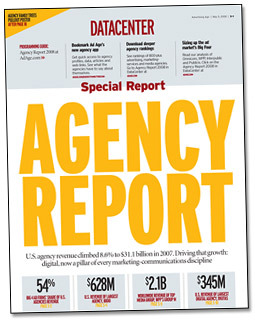 Agency revenue grew 7.2% in 2005 and 8.6% in 2004. Revenue for U.S. ad, marketing-services and media agencies in 2007 reached $31.1 billion, according to Ad Age estimates. Marketing-services agencies — direct, promotion, branding, healthcare and public relations as well as digital specialists — accounted for 47.1% of U.S. revenue for marketing-communications agencies analyzed in this report. The rest came from advertising and media. Omnicom’s BBDO Worldwide topped Ad Age’s new ranking of U.S. agencies across disciplines. The ranking shows how agency brands stack up regardless of whether an agency gets revenue from advertising, marketing services, media or a combination of the three. WPP’s Group M ranks No. 1 in worldwide media revenue. Omnicom’s OMD Worldwide is the world’s largest media agency, while WPP’s MindShare is tops in the U.S., according to Ad Age estimates. WPP’s CommonHealth leads the ranking of U.S. healthcare agencies. This is Ad Age’s first broad ranking of healthcare agencies since major holding companies opted to limit disclosure after passage of the 2002 Sarbanes-Oxley Act.